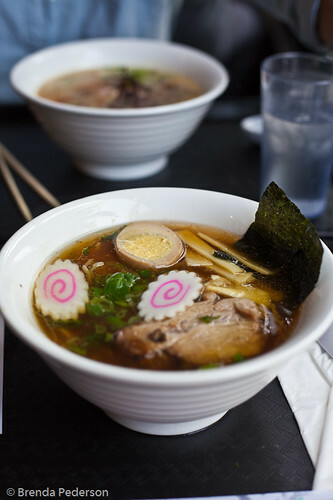 There’s a new noodle shop in the University District. Samurai Noodle, which has a location in Uwajimaya in the ID, recently opened a second location on The Ave. (For those of you not familiar with the U District, The Ave is University Way, which makes no sense but that’s how it is.) 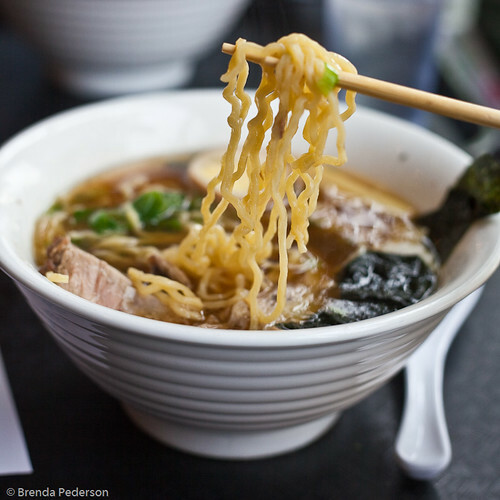 Samurai’s claim to fame is its ramen, and we are not talking about the 10 for a dollar packages many college students survive on. 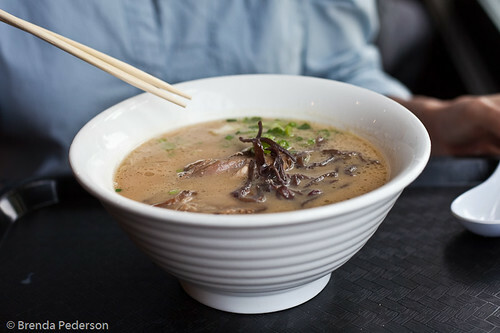 Your choice of deep, rich broth; tons of long curly noodles, cooked to your specification (soft, medium or firm); slices of pork (or choose a vegetarian option); and various add-ons make a noodle soup worth craving. It was just such a craving that brought M and me to this new location on Sunday. She’d been thinking of noodles for days and we made a date to scratch that itch. We were the first people in the shop, although others followed soon after. I had a hard time making a decision and finally settled on a chicken broth with added egg, bamboo shoots and strips of seaweed, as well as the pork. It was called the #5 Tampopo, named after the movie. M chose a combination of tounyu (chicken) and tonkotsu (pork). Service was friendly and quick. In no time at all we were enjoying the hot bowls of soup. M was completely satisfied with hers as it was delivered from the kitchen. Mine had so many noodles I can’t imagine ever ordering more which is an option, but the broth seemed just a tad bit bland. That was quickly rectified by adding a sprinkling of noodle seasoning and a few chile flakes. If I worked in the U District I could see making this a regular lunchtime spot. Besides being tasty the bowls of soup are a great value. I didn’t even finish my lunch and was still full enough that I didn’t want dinner.